Well it was not a game that will be talked about fondly in years to come but it is a win that cements Barcelona's passage to the Copa del Rey quarter-finals, where they will meet Atletico Madrid. The winner of that game to win the whole thing? That's all from us for today, thanks for your company and until next time, goodbye. That's it. We didn't quite reach double figures for the aggregate score but Barcelona will not care. A comfortable win. A bit more gloss is added to the scoreline as defender Adriano powers in a header. Marc-Andre ter Stegen is called into action for the first time in the game as the Barcelona goalkeeper gets down low to deny a shot he did not see until late, before then holding up the follow up effort. That's Elche's first two shots on target. It has been that kind of game. Marc Bartra gets a little bit excited as he charges forward with the ball at his feet. The Barcelona defender can certainly hit a ball well, but not this time as he lashes an effort high into the stands. The hosts are maybe trying to get a late consolation goal as they throw on attacking midfielder Faycal Fajr for the last 10 minutes, replacing defender Sergio Pelegrin. This game is drifting towards its inevitable conclusion as we enter the closing stages. It has really been nothing more than a bit of match practice for both teams, it has certainly felt that way from watching. Sweeper keeper! Lovely stuff from Barcelona goalkeeper Marc-Andre ter Stegen as he mirrors his compatriot Manuel Neuer by coming off his line to chest down a long ball with one movement, and volley a pass with another. Classy. Richard Cook: Saw Halilovic play for Croatia v Argentina at Upton Park, easily the best player on the night + has a bright future. Almost the perfect debut for young Alen Halilovic as the teenage midfielder, possibly with his first touch, bends a shot from the edge of the area and it strikes the base of the post. Elche, meanwhile, make another change as Rafa Galvez is replaced by defender Enzo Roco. Barcelona make a couple of changes and give Croatian prospect Alen Halilovic his senior debut. The midfielder replaces Adama Traore while defender Douglas is on for Martin Montoya. For Elche, midfielder Adrian Gonzalez is on for Mario Pasalic. Elche embark on a counter in numbers and they do well as Cristian Herrera gets beyond a defender on the left before attempting to cut the ball back into the middle of the area but Jeremy Mathieu is wise to it and the defender clears. Tom Strafford: Sergi Roberto is an outstanding young player. Sergi Roberto is having a superb game. He has been everywhere for Barcelona tonight both when they attack and defending when needed. The visitors are still in control. Peter David Smith: Real Madrid comfortably beat Barcelona, Barcelona outplayed Atletico and Atletico have the measure of Madrid. Fascinating. Wonderful football from Barcelona and it should have ended in goal number four as Sergi Roberto flicks a delightful pass with the outside of his boot to Adama Traore, racing in on the right side of the area, but he fires just wide with just Herrera Yague to beat in the Elche goal. Barcelona are straight on the front foot as Martin Montoya plays a clever one-two before shooting just wide. This could be a long 45 minutes for Elche. It's all over in the Coppa Italia last 16 as Juventus cruise past Hellas Verona 6-1. Easy. pSYChO: Sergi Roberto is a very good talent. First team player. Back under way at Elche. A couple of words from Fernando Torres after he scored his first goals for Atletico Madrid earlier following his return to the club. "The fact that we scored so early meant we could play the game we wanted," he says. "I was smiling when I came off because of the win and for scoring my first two goals (since I returned to Spain) and also for doing it in a stadium where I hadn't managed it before." We should have more reaction from the former Chelsea striker later on. Dominant in possession, clinical in front of goal. Barcelona had just three shots on goal in the first half but made them count, the pick of their goals perhaps Jeremy Mathieu's free-kick. Will he fancy taking on Lionel Messi to be Barcelona's free-kick taker? You would not have realised Barcelona had made a number of changes, a very dominant first-half display. Juventus are enjoying themselves against Hellas Verona, leading 6-1 in the Coppa Italia last 16. Sebastian Giovinco, Roberto Pereyra, Guillermo Rodriguez, Paul Pogba, Alvaro Morata and Kingsley Coman were on target for the hosts, with Nene hitting Verona's consolation. ...Pedro steps up to take the penalty and confidently sweeps it into the back of the net, with the goalkeeper having dived the wrong way. Oh it is another beauty for Barcelona and it is all too easy for the Spanish giants. Sergi Roberto receives the ball just outside the area, eyes a gap in the Elche defence and curls a peach of shot into the back of the net. Adama Traore is a big lad but has some deceptive pace for his size and the 18-year-old is proving a handful for Elche. He turns a defender inside out, runs along the edge of the area and shoots just wide. Barcelona look great going forward, mixing up slow and patient build-up play with fast, incisive passes but the final ball is letting them down. Sergi Roberto squeezes through two defenders and into the area but his cutback is over hit and Elche clear. Cristian Herrera has some pace and he bursts forward for Elche with a team-mate in support. The Barcelona defence is wide open but Marc Bartra marshals Herrera superbly to block the forward's attempted cross. Pedro latches on to a ball over the top as Barcelona chase a quick second, he tries to pick out Sergi Roberto, but Herrera Yague dives on the ball to snuff out the chance. What a strike! Barcelona win a free-kick as Edu Albacar has not got the pace to go with Adama and resorts to fouling him, some 30 yards from goal. 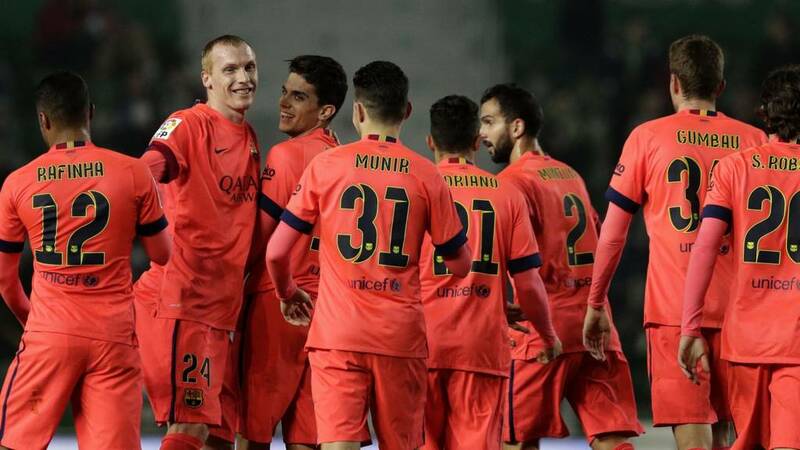 Barcelona defender Jeremy Mathieu steps up and rifles the free-kick into the back of the net. Much better from Elche as Cristian Herrera tries to get on the end of a knockdown in the middle of the area, Barcelona hack the ball behind and the corner is cleared. Elche are struggling to do little more than pump the ball forward as Barcelona continue to dominate without particularly threatening. The hefty scoreline on aggregate means this game has a bit of a peculiar atmosphere, very much like a pre-season friendly. Despite fielding a fringe side, Barcelona are well in control and they should be ahead as a cross is headed down into the area, Rafinha misses it but defender Adriano looks certain to fire in only to scuff wide. It is a bright start by Barcelona, who have eight former academy players on show, 19-year-old forward Munir El Haddadi smacks a stinging effort at goal, but is flagged offside. Kenneth Barr: How much longer will Simeone last at Atli before a "big club" snatches him? Great job as he is now the top dog in Madrid! Isaac Manda: If there's a guy who really deserves a round of applause, it's Diego Simeone. Off we go at Elche. Some unfamiliar names on show for Barcelona, but could they make a name for themselves tonight? Barcelona lead 5-0 on aggregate and the winner of this tie, by the way, will play Atletico Madrid in the Copa del Rey quarter-finals. Swooooshh! That is the sound of us taking a digital leap from Madrid to Elche. Real Madrid may have failed to give us the comeback we perhaps craved, so maybe Elche can do just that and overturn a five-goal deficit against Barcelona? Drewbert: Happy for Torres but lets not make out he's going to win the Ballon d'Or after 2 goals. Good start but got to maintain it. The Copa del Rey holders are out! Job done for Atletico Madrid as they beat Real on aggregate to progress. Familiar stance from Cristiano Ronaldo as Real win a late free-kick, unfamiliar shot by the forward as he smacks it high and wide to the sound of ironic cheers from the away fans. Just about sums up Real's day. Four minutes of added time. Four minutes before Atletico's place in the quarter-finals is confirmed. Cheers from the away end as Atletico Madrid toy with Real, passing the ball around to wind down the clock. Andrew Priestley: Real Madrid's defence is costing them again. No matter how good your attack is, you can't out-score the opposition every time. Zavair Baakza: All this talk of Torres coming home but one shouldn't forget the real reason. Mr. Simeone sure knows how to rekindle talent. There have been a few late yellow cards with Real pair Marcelo and Dani Carvajal both going into the referee's book as frustrations start to show. A few moments aside, it just has not happened for Real today. Lots of love from you guys for Fernando Torres. If I was a) good at football and b) out of form I'd love to sign for Diego Simeone. He just seems to get the best out of his players. Are we seeing Torres back to his best? Gareth Bale flicks Marcelo's cross over, but there was no conviction in the effort. Atletico Madrid make another change as Raul Garcia makes way and Raul Jimenez is given a run out in attack for the final few minutes. Atletico Madrid have not conceded four goals in a game all season. Real Madrid need to find three in 13 minutes. A big ask, even more so when Real seem to have lost any zip they had now, passing the ball around lazily. Given up? Atletico Madrid also make a change as forward Antoine Griezmann strolls off, he is in no hurry. On trots midfielder Gabi for the closing stages. Three goals in less than 20 minutes, can Real Madrid do it? They make another change as James Rodriguez is replaced by 21-year-old forward Jese. Gary Breed-Notley: Torres has always had the ability, but he needs the love from the fans. He gets that at Ath Madrid as he did at Liverpool. Real Madrid are pawing at the Atletico Madrid defence as they try to work an opening, Marcelo eventually opting to drag a shot wide from distance. Their biggest threat looks to be from set pieces, and so it proves as Karim Benzema volleys just over from a corner. Goals from Roberto Pereyra and Sebastian Giovinco put Juventus firmly in control in the last 16 of the Coppa Italia, as they lead 2-0 after just 25 minutes. Gareth from Staffordshire on text: Even though I can see this game going Atletico's way, I admire the fight coming from the Real team. Hala Madrid! Liam, South Wales: Even as a Chelsea fan, I'm relieved for Torres. Wish him well at his hometown club! Midfielder Gerard Gumbau is handed his Barcelona debut for a team that, as expected, see plenty of changes. No Lionel Messi, Luis Suarez or Neymar but they do lead 5-0 after the first leg. Elche: Manu, Herrera, Peral, Lomban, Pelegrín, Edu Albacar, Galvez, Pasalic; Coro, Alvaro, Fragapane, Cristian Herrera. Barcelona: Ter Stegen, Montoya, Pedro, Rafinha, Bartra, S. Roberto, Adriano, Mathieu, Adama, Munir, Gumbau. Real Madrid are forced to make a change as Pepe goes off clutching his chest after taking a heavy blow. Raphael Varane jogs on in his place. Petter Cronberg: Torres back on track. imagine what the feeling of coming home can do. Tom Chance: This Torres kid looks like he's going places. Chelsea should go in for him in the summer. Joshua Mwesigwa: Torres' EPL stint paid the bills and probably secured his future but at Atletico, that's where his heart is. What a game we have on our hands here! Real Madrid have been a bit sleepy in this half but they finally awake to drag themselves back level on the night. Gareth Bale clips a fine cross into the area and Cristiano Ronaldo is there to head in. Deafening cheers around the stadium. Jill, Leamington Spa, on text: So happy for Torres, looks like he's got his mojo back! Fernando Torres is absolutely brimming with confidence as he breaks forward in search of his third and almost bundles his way through two defenders, but is dispossessed. Antoine Griezmann is on the loose ball in a flash, but lashes wide. Juventus begin their campaign to end a 20-year wait to lift the Coppa Italia for the 10th time against Hellas Verona. Massimiliano Allegri's men, in the last-16 clash at the Juventus Stadium, have not lost on home soil to Verona in the last eight meetings. Capital R: Fernando Torres is HOME. It took Fernando Torres 46 seconds to score in the first half and less than a minute to add a second after the break. Swift. Unbelievable! Real Madrid came out on to the pitch early but their minds were still in the dressing room as they again let Atletico Madrid charge forward and score through that man Fernando Torres. Antoine Griezmann leads the attack again, watching the run of Torres before passing to his team-mate, who runs through and squeezes a brilliant shot into the net from a tough angle. A great finish, the man is on fire! The last time Real Madrid progressed in the Spanish Cup after losing 2-0 was in 1993 against Mallorca. They went on to win the whole tournament. Can they stage a similar fightback? Second half under way. Real Madrid are the first out for the second half, a good minute or two before their Atletico counterparts. Eager to get going? Jack Adair: As a Barca fan I shouldn't be saying this considering the last day of the season but come on Atletico!! clifton kawanga: To shoot or not? That is the question every time #Bale gets the ball within range. Daniel Woodley: Diego Godin has been magnificent in that first half. But didn't make the world team of the year. Staggering. Rio Ferdinand on twitter: Godin.....if @ManUtd are looking to strengthen in defence I hope they are onto him! Solid. Disappointing defending for Sergio Ramos's goal aside, Atletico Madrid defended very well in the first half, Diego Godin in particular. He has dealt with pretty much everything Real have thrown at him in the box. Ian Manson on text: I always love these Madrid derbies. The royalty of Real versus the working man's Atletico. Up the workers ! All square on the night at the break but Atletico 3-1 up on aggregate. A very good response by Real, but they will need to step it up another gear in the second half. Marcelo fizzes in a low effort from outside the box towards the near post but Jan Oblak is behind it before Gareth Bale's cross is headed away. The way things are going, we could well be seeing some crossing stats akin to Manchester United's against Fulham last season. What was it, 81 crosses in that game? There has been a fair few in this half already. QPR defender Rio Ferdinand: All this crossing from out wide is food & drink for this Atletico back four....1 2's around the box to get behind the back 4 is needed. Real's tactic appears exclusively to be send as many crosses into the box and hope something pays off. Another ball is sent in from out wide, Karim Benzema stretches acrobatically to bring the ball down but his shot lacks power to trouble Jan Oblak. Jake Pincombe: Anyone else think Bale looks a little hesitant in the final third? Ronaldo's negative criticism at work? Another update, another Real Madrid attack as James Rodriguez pings the ball into the box, Gareth Bale heads across goal for Karim Benzema but his shot hits one of the many Atletico bodies in the area. Josh Brannan: Real Madrid are going out to Atletico tonight I know it's 1-1 but Real Madrid always fall in the derby matches. Nathaniel Onigbinde: I'm so sure there won't be a repeat scoreline of the Champions League final. Vamos Athleti!!! How has Diego Simeone crafted such an efficient Atletico Madrid side? Barely any of the possession, one shot and one goal. Luck? Or something more? Those possession stats are not going to improve any time soon, Real barely go a few seconds without the ball as they look to grab a second. Joseph Dempsey, Lancashire, on text: With Bale, Ronaldo, Rodriguez, Kroos and Benzema in this side, don't rule out Real getting four goals! Again Real come forward as Juanfran deflects Cristiano Ronaldo's header behind before Toni Kroos tries to drive a low effort through a crowd of players from the edge of the area, but Atletico scramble clear. Desperate defending. We have our first yellow card of the game as Raul Garcia slides in on James Rodriguez and is booked as a result. Atletico will just welcome the slight pause in play after having to withstand a succession of Real attacks. Alex Butler: This could be fun...! Charlie Fairbank: Please, tell me what happened in the Champions League Final 2014, 1-0 down to 4-1 up to win the trophy, I believe? Midway through the first half and you just know this is going to be a classic. Real have their tails up and it is attack after attack and Cristiano Ronaldo looks certain to drive in a loose ball but Diego Godin puts his body in the way to block the shot. Game on! Atletico have been giving away too many set pieces and it was only a matter of time before Real punished them. Toni Kroos whips in a free-kick and Sergio Ramos leaps to power home a header. A chance for Real Madrid as Toni Kroos whips in a solid corner to the middle of the box, it is knocked down to the feet of Cristiano Ronaldo but he can't react quickly enough to poke in before Jan Oblak smothers the ball. Atletico are giving Real Madrid's forwards no space at all, with eight outfield players back defending whenever the hosts come forward which, at the moment, is often. Isco tries to jink his way into the area, no joy, before Gareth Bale's cross is straight into the hands of Jan Oblak. A frustrating 78 minutes ahead for Real. Phil on text: Great to see Torres score, although it didn't work out for him at the Bridge he still scored some vital goals for us. Who can ever forget that goal in the Nou camp. Hope he does well at Atletico. Real come forward again as this time James Rodriguez sends a high ball into the box, Karim Benzema peels away from Diego Godin and rattles off a volley that, fortunately for Atletico, strikes Godin's back and goes out for a corner. So Real Madrid have to score four goals to progress. Tough, very tough, it will be the comeback of all comebacks if they manage it. Atletico are sitting deep since going ahead, packing their defence, but Real offer up their first response to Fernando Torres's goal as Gareth Bale flicks a header towards goal, but it lacks power and Jan Oblak pulls it out of the air. Tom Proctor: El Nino!!!!!!! Most important goal since the champions league with Chelsea. Do not adjust your screens, Fernando Torres has indeed scored at the Bernabeu! Antoine Griezmann scampers off on Atletico's first attack and crosses low towards the far post where Torres, just like the Torres of old, confidently despatches a first-time shot into the back of the net. That's his first goal in nine derbies at the Bernabeu. Group hugs done, a final kiss of the Ballon d'Or by Cristiano Ronaldo and we are under way. A ridiculously massive banner with a picture of Cristiano Ronaldo's face on it covers almost the whole of one side of the Bernabeu as the Portuguese winger holds aloft his Ballon d'Or award. He is loving this. An absolutely incredible atmosphere at the Bernabeu as the two teams stroll out on the pitch. The home fans are certainly doing their part, but can Real Madrid produce the comeback they want to see? Anisu adebanji: The octopus that predicted German matches in 2010 world .He got all the prediction right. ...instead thousands of fans were gathered outside the ground to greet their heroes. Amazing scenes. Carlo Ancelotti may want his Real Madrid players to pass more, but he may do well to urge his players to be more direct tonight. They had plenty of the ball in the first leg, but a lot of good that did them. He may not be playing this evening, but it is hard to keep Lionel Messi out of the headlines at the moment. huge £480m move for him as rumours of his unrest at Barca continue. Barca boss Luis Enrique says a Barcelona side without the Argentine is unthinkable but the player himself has sent out mixed messages. "nobody knows what the future holds". So who should we look out for then? Luis Enrique has named the six reserves in the squad, including a first call-up to the first team for midfielder Gerard Gumbau since his arrival from Girona in July 2014. Alen Halilovic, the teenage sensation who became the youngest ever debutant for the Croatia national team against Portugal in June 2013. Just over 20 minutes until kick-off at the Bernabeu, giving us enough time for a quick look at tonight's other Copa del Rey fixture - Elche v Barcelona. There have been some strange things that have happened in the world of sport but should Elche progress to the last eight this evening, it would have to go down as one of the strangest. lead 5-0 after the first leg and should cruise into the next round against a team second from bottom in La Liga. Nothing is certain in football but this has to be as near to a certainty as you can get. Doesn't it? Gareth Bale, by the way, has been working hard off the pitch as he looks to learn more of the local lingo. What's Spanish for 'pass the ball'? Michael Louw: My Sunday league team's goalkeeper licks both posts and the crossbar before every game. We're unbeaten this season though! Cristiano Ronaldo will not be the only Real Madrid player with extra incentive to inspire a comeback today. when they won the Copa del Rey last year, scoring the late winner against Barcelona, but that will probably feel like a lifetime ago for the Wales forward. Bale was booed by Real fans after going for goal - and missing - instead of passing to Cristiano Ronaldo in last Saturday's 3-0 win against Espanyol. Real boss Carlo Ancelotti backed Bale, but said he will not settle for any sign of selfishness in tonight or any other game. "If there is any play which seems selfish we'll clearly fix it," he said. "We have fans who demand a lot. Bale is a fundamental player like Cristiano and for that the fans demand much more than of others." Impressive scenes on the streets of Madrid just a few minutes ago as the Real Madrid team coach carefully made its way to the Bernabeu. Got to be one of the best, and most atmospheric, derbies in world football? Enlisting the spirit of a former footballer is one of the crazier things I have heard someone do in the hope of predicting, or influencing, the outcome of a game. But whether it is wearing lucky pants to a cup final or sticking to a specific routine before every match, I'm sure we've all tried to do our bit to persuade the cosmic powers to help our team win. Now I've heard some pretty odd stories about people doing strange things to try and influence a result, most of them involving Uri Geller. Famed for his cutlery-bending exploits, Geller has also claimed to have played his part in events in the football world. He once went on TV to persuade the nation to touch an image of David Beckham's foot to help it heal in time for the 2002 World Cup and also ran round Highbury a few years ago to "create psychic energy" and help Newcastle claim an unexpected win at Arsenal. to summon the spirit of late Real legend Juanito, who told him the La Liga leaders will beat rivals Atletico 3-0 and progress. Real Madrid make four changes for the visit of Atletico Madrid, one in goal as Keylor Navas replaces Iker Casillas and three in the back line as Sergio Ramos, Marcelo and Dani Carvajal are all recalled. Fernando Torres will face Real in an Atletico shirt at the Bernabeu for the first time since 2006. He is picked ahead of Mario Mandzukic, who has had a fever recently, with boss Diego Simeone making four other changes from the weekend defeat against Barcelona as neither Gabi or Arda Turan start. Atletico Madrid XI: Oblak, Juan Fran, Miranda, Godin, Siqueira, Mario Suarez, Tiago, Koke, Raul Garcia, Griezmann, Torres. Real Madrid XI: Navas, Pepe, Ramos, Marcelo, Carvajal, Kroos, Isco, Rodriguez, Ronaldo, Benzema, Bale. How big a say could Fernando Torres have in tonight's game? The former Liverpool and Chelsea striker is back at his boyhood club and bidding to reignite his career, but failed to make an impression in the first game on his return - last week's first-leg match against Real - as he was substituted after one hour. History suggests he is unlikely to have much of an influence today as well. During his first spell at Atletico, he never scored, or finished on the winning side, at the Bernabeu. Yep, it is safe to say it has been a pretty good week for old Ronnie, which has mostly been spent attending glittering ceremonies and polishing the latest trophies for his already sizeable collection. Now, though, it is back to business. Just under a year ago, an injured Cristiano Ronaldo had to watch from the sideline as his Real Madrid team-mates celebrated beating Barcelona to win the Copa del Rey, and he will no doubt be determined not to miss out again. Hello! Welcome to a bit of midweek European football live text commentary action as three of the La Liga heavyweights look to seal their place in the Copa del Rey quarter-finals. Barcelona have pretty much all but a foot in the last eight after beating Elche 5-0 in their first-leg match and, barring a ridiculous turn of events, should cement their passage when their game kicks off at 21:00 GMT but our immediate focus is on a tie that has all the makings of being a very tasty one indeed. ...fortunately for said museum curator, there is at least one medal that it looks highly unlikely he will need to make space for. Tonight, Real Madrid will look to overturn a two-goal deficit against Atletico Madrid and stay in the Copa del Rey. An almighty task it would seem, but then, with Cristiano Ronaldo in their side, you wouldn't bet against them doing just that, would you?